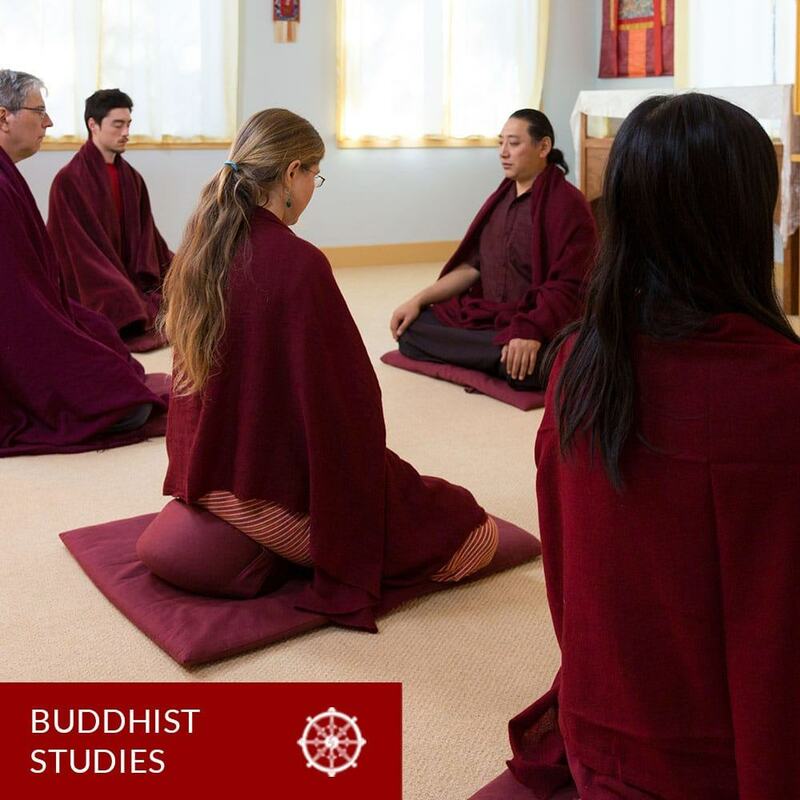 At the heart of the Institute’s programs are in-depth courses in traditional Buddhist Studies. These courses investigate the nature of the Buddha, Dharma and Sangha; Abhidharma, the study of mind and mental events; the Bodhisattva path and the six perfections, and other related topics. Our premier Buddhist Studies course is the two-year Path of Liberation Program. The Buddhist Studies program presents the Dharma as a view and a way of life that ultimately uncovers the truth of the human condition. Fundamental to this understanding are the Three Jewels: the Buddha, Dharma, and Sangha; the three divisions of the Buddha’s teachings: Vinaya, Sutra, and Abhidharma; and the trainings in ethical discipline, meditative concentration, and wisdom that these teachings promote. Upheld and transmitted through accomplished Buddhist masters, these teachings gave rise to four major philosophical schools and to works of the great masters that expressed the teachings in dialectic, detailed explanations, logic, eloquent literature, sadhanas, and songs of realization. This body of knowledge was transmitted in its entirety to Tibet, where it formed the foundation of all Tibetan Buddhist schools. Coursework at the Institute through 1978 and 1979 was centered on the special curriculum that Tarthang Tulku designed for a Masters program. Based in large part on Lama Mipham’s mKhas-’jug, this curriculum included Buddhist Philosophy and Psychology, Tibetan and Sanskrit languages, traditional meditation practice, and Kum Nye relaxation. In 1980 when the formal Masters Program ended, courses in Buddhist Studies at the Institute were broadened to serve a wider audience. For this purpose, the curriculum for the Masters Program provided the Institute with a valuable model that the faculty continues to reference as an aid to course design and teaching. During the next decade, Buddhist studies were integrated with Nyingma practices in classes that focused on translations of key Mahayana texts. Traditional subjects were studied using readings from the Crystal Mirror Series. Buddhist studies continued in this less structured way until 1993. In 1993, many of the topics covered in Lama Mipham’s mKhas-’jug were incorporated into the book Ways of Enlightenment. Building upon that text, the Buddhist Studies curriculum was reshaped toward a structure that more closely follows a traditional education in Dharma topics. In 1995, Tarthang Tulku gave fresh impetus to the Dharma study programs by creating an Eighteen-Month Program in Nyingma Education. This program was taught from 1996 to 2003. In 2004 a new one-year program titled “Opening to the Dharma” was initiated based on Tarthang Tulku’s guidance. That program was taught through 2007 when the two-year program, “Path of Liberation” was developed in order to provide an even more comprehensive training for students. The Institute also offers quarterly courses and lectures in Buddhist studies which present readings in key texts such as the Bodhicharyavatara and the Jewel Ornament of Liberation. These courses focus on developing appreciation for the depth and richness of the tradition.